The U.S. Mint joined the American Legion Wednesday, Aug. 9, at its national convention to reveal designs for the trio of 2019-dated coins commemorating its 100th the anniversary. The American Legion 100th Anniversary Commemorative Coin Program designs are unveiled at the American Legion conference August 29, 2018, in Minneapolis, Mn. Shown are American Legion National Commander Denise Rohan and Congressman Tim Walz. U.S. Mint photo by Tracy Scelzo Chavez. The Legion (www.legion.org) was charted by Congress in 1919 as a patriotic organization for veterans. It quickly grew into one of the largest veteran’s service organization in the United States. 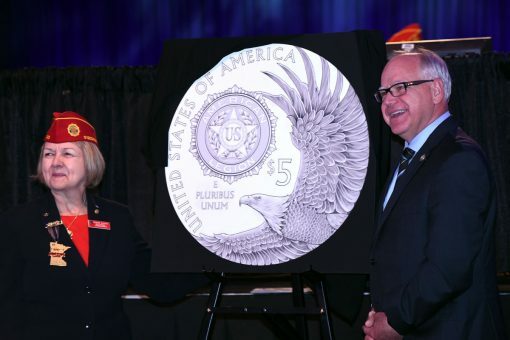 U.S. Mint Director David Ryder and American Legion National Commander Denise Rohan appear on stage at the coin design unveiling event. U.S. Mint photo by Tracy Scelzo Chavez. On Oct. 6, 2017, President Trump signed into law the American Legion 100th Anniversary Commemorative Coin Act (Public Law 115-65). 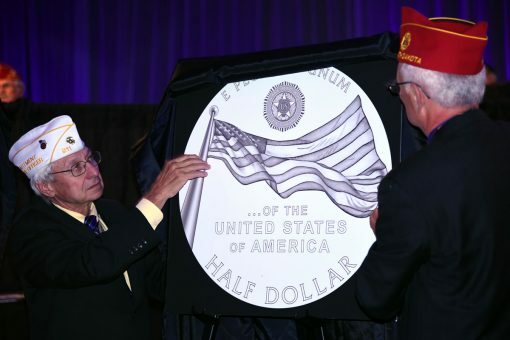 It directs the U.S. Mint to make and sell up to 50,000 $5 gold coins, no more than 400,000 silver dollars, and a maximum of 750,000 clad half-dollars in collector qualities of proof and uncirculated with designs emblematic of the veterans organization. 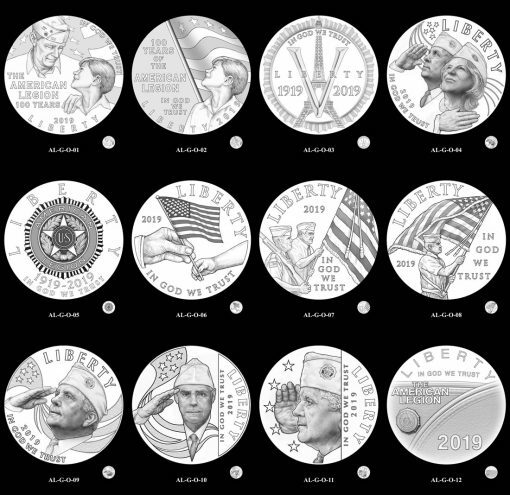 Sixty-three design candidates were created for the commemorative coins as part of the process leading up to their release. From those, six were selected after undergoing a review with three designs chosen for the coin obverses (heads side) and three picked for the coin reverses. Over 60 design candidates were created for the American Legion Commemorative Coin Program. 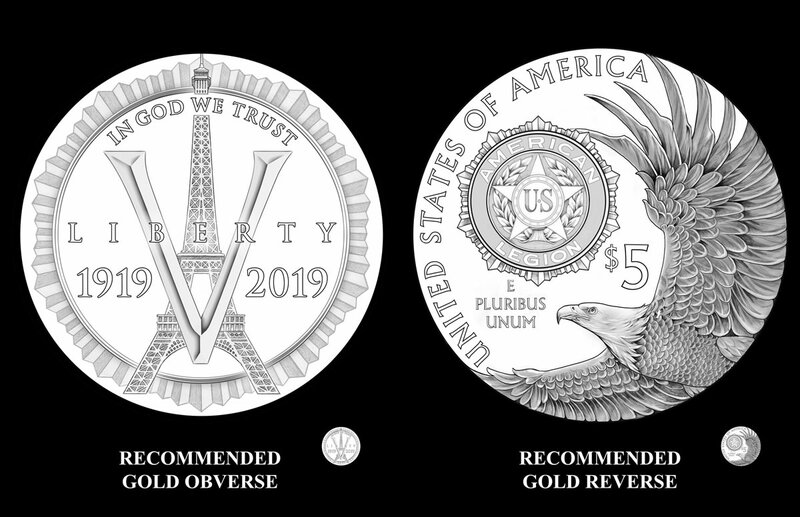 The image above shows just the designs reviewed for the obverse or heads side of the 2019 $5 American Legion Gold Coin. The artists in the U.S. Mint’s Artistic Infusion Program created the designs and the Mint’s Sculptor-Engravers sculpted them for coins. 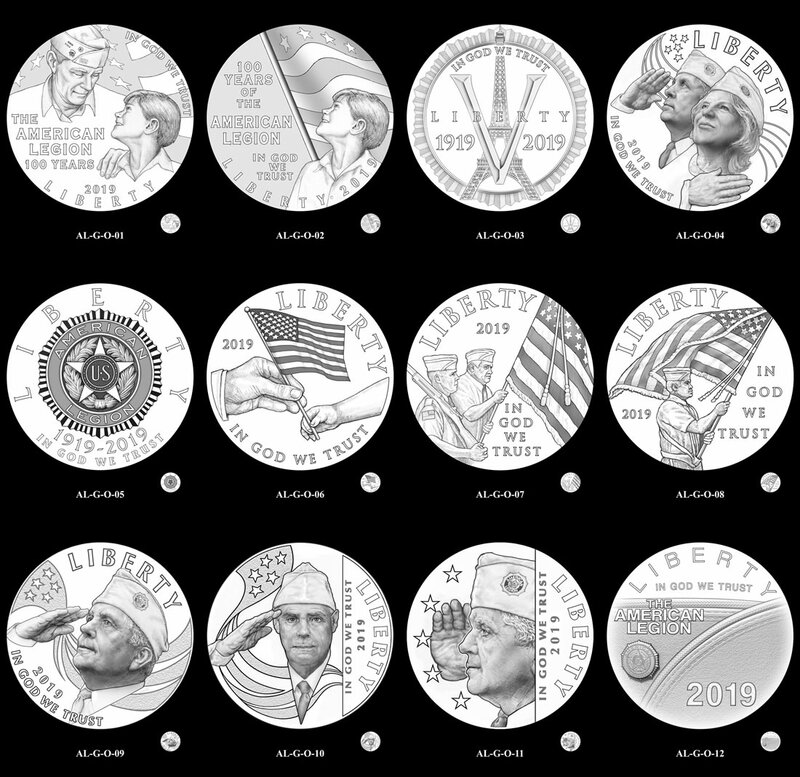 Below are U.S. Mint descriptions and line art images of the selected designs. Designed by Chris Costello and sculpted by Phebe Hemphill, the $5 gold coin obverse commemorates the inception of the American Legion and its mission to serve America and its war veterans. The outer geometric rim design from the American Legion emblem, the Eiffel Tower, and V for victory represent the formation of the organization in Paris in 1919 at the end of World War I. Inscriptions are "IN GOD WE TRUST," "LIBERTY," "1919," and "2019." Designed by Paul C. Balan and sculpted by Joseph Menna, the reverse depicts a soaring eagle, a symbol of the United States during times of war and peace alike. The American Legion emblem is depicted above the eagle. Inscriptions are "UNITED STATES OF AMERICA," "$5," and "E PLURIBUS UNUM." 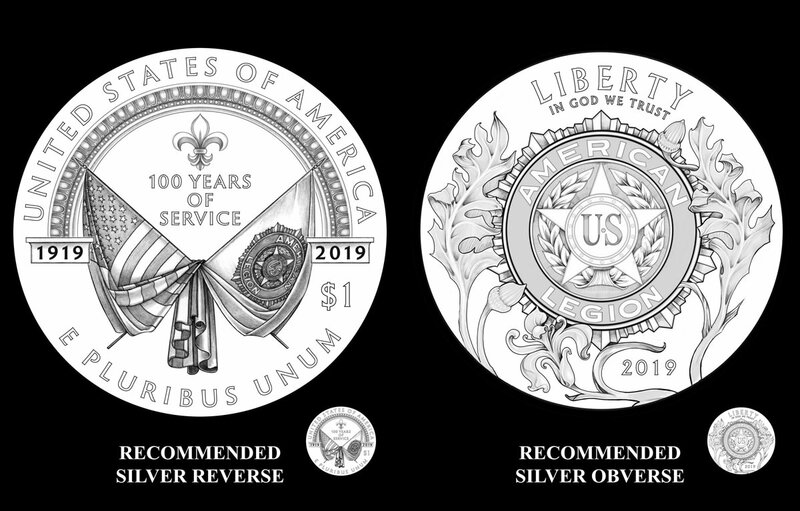 Designed by Paul C. Balan and sculpted by Renata Gordon, the silver dollar obverse depicts the American Legion emblem adorned by oak leaves and a lily, commemorating the founding of the American Legion in Paris, France. Inscriptions are "LIBERTY," "IN GOD WE TRUST," and "2019." Designed by Patricia Lucas-Morris and sculpted by Michael Gaudioso, the reverse represents the founding of the American Legion in Paris in 1919. Above the crossed American and American Legion flags is a fleur-de-lis and the inscription "100 Years of Service." Additional inscriptions are "UNITED STATES OF AMERICA," "1919," "2019," "$1," and "E PLURIBUS UNUM." Designed by Richard Masters and sculpted by Phebe Hemphill, the half dollar obverse depicts two children standing and reciting the Pledge of Allegiance, the little girl proudly wearing her grandfather’s old American Legion hat. Inscriptions are "LIBERTY," "2019," "IN GOD WE TRUST," and "I PLEDGE ALLEGIANCE TO THE FLAG…"
Designed by Richard Masters and sculpted by Joseph Menna, the reverse design completes the phrase from the obverse "I pledge allegiance to the flag… of the United States of America." It depicts an American Flag waving atop a high flagpole as seen from the children’s point-of-view from the ground below. The American Legion’s emblem is featured just above the flag. Additional inscriptions are "E PLURIBUS UNUM and "HALF DOLLAR." 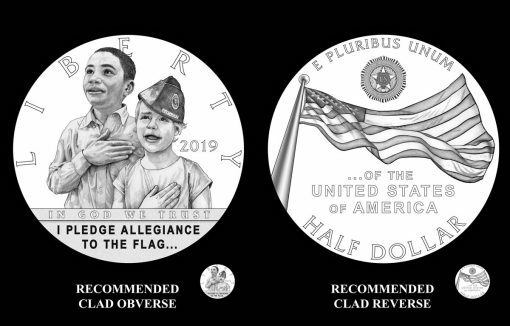 A release date and pricing details will become available for the American Legion Commemorative Coin Program prior to its launch in early 2019. 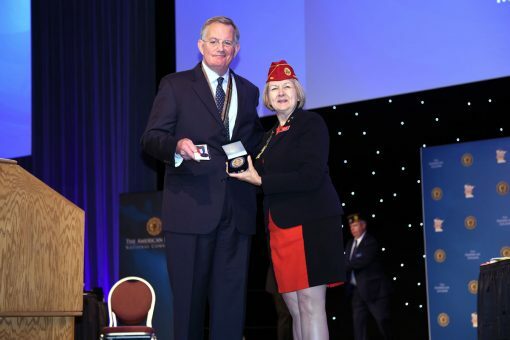 Under the terms of the law, a surcharge of $35 per gold coin, $10 per silver dollar and $5 per clad half-dollar will be added to each coin sale with collected funds — provided the coins turn a profit — paid to the American Legion to support its programs for veterans, members of the Armed Forces, and other purposes specified by the authorizing legislation. The half dollar obverse looks odd with obama and laura ingraham as kids. We need a LGBTIQ commemorative coin program for the Stonewall Bar riots. I couldn’t agree more. The more diversity, the better. Sounds like a mental illness.